For a few of years I’ve been haunted by a story arc from The New Titans dubbed “The Titans Hunt.” Since my original reading of the storyline in 1990, it’s lived in my mind as one of the greatest Teen Titan stories ever told. For a couple of years now I’ve wanted to revisit the story, but haven’t been willing to invest in the floppies knowing I already had them sitting in a long box 3,000 miles away. On a recent trip to my childhood home, I decided to crack open that box, pull out a big chunk of nostalgia, and pack it all in my luggage (I had to steal a second suitcase from my parents because I ended up taking 15 pounds of comics back with me). The “Titans Hunt” story arc runs from issue 71 through 84, but the fallout from the events in “Titans Hunt” ripple well beyond issue 100. In the letter section of issue 71 editor Jonathan Peterson promised to “shake things up” as the title had fallen into a rut. Working with longtime Titans writer Marv Wolfman and penciler Tom Grummett little time is wasted turning the Titans inside out like a baboon through a Brundle telepod. 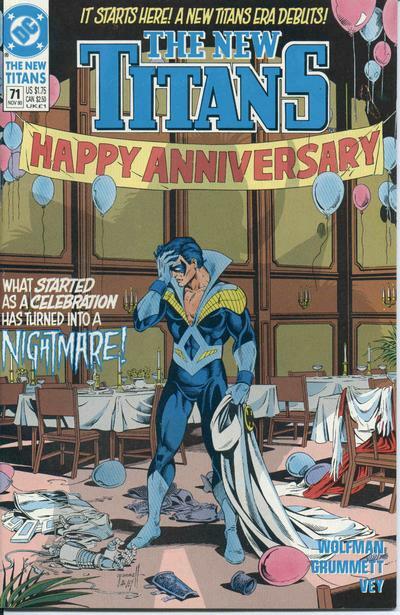 By the end of the first five issues in the arc most of the Titans are captured by the Wildebeest Society for a mysterious experiment, Aqualad’s in a coma, Titans Tower has been demolished, Jericho is revealed to be a traitor, and some b-list Titans are “dead” (I run the tally at the end of this post). Wolfman doesn’t hold back when it comes to putting these beloved characters (many of whom he created) through the grinder. Peterson definitely got his wish by the end of the storyline with most of the core members who’d been on the roster for more than a decade out of commission.